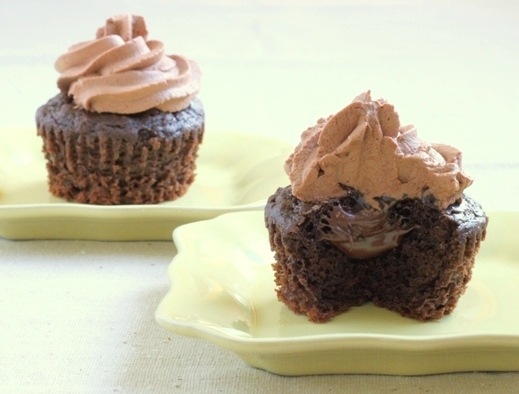 There are some days when you just need a triple chocolate cupcake. You know you are in need of a triple chocolate cupcake when a cold front in mid-May kills all the peppers and melons in the field. Or, when a 2-minute hail storm pelts holes into your tender collard greens, swiss chard and zucchini plants. On days like this, I close the curtains to hide from sight the impending storms just over the hills. I get the urge to bake, most likely as a way to distract myself from worrying so much. The smell of something chocolatey baking in the oven comforts me. The quick 30 seconds it takes to make this delicious whipped cream frosting brings a much-needed smile to my face. 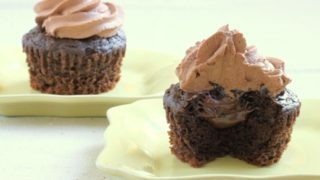 I’m lucky that I have time to replant (using the help of a warm greenhouse), and I’m also lucky that these cupcakes are so easy and quick to make. I hope they brighten your day as much as they did mine! Preheat the oven to 350° and line a muffin tin with 4 paper liners. In a small bowl, sift together the flour, cocoa powder, baking soda, baking powder and espresso powder. In a medium bowl, whisk together vigorously the oil, vanilla, and brown sugar. Using a spatula, add the dry ingredients to the wet in two batches, alternating with the buttermilk. Divide the batter between the muffin cups and bake 15-17 minutes, or until a toothpick inserted comes out clean. Let cool completely on a wire rack before proceeding. Stir together the Nutella and sour cream and set aside. Snip off the corner of a plastic bag or pastry bag and place it in a tall glass. Put a metal round tip in the corner. Add the Nutella-sour cream mixture and squeeze it down to the tip. Gently poke a hole in the top of each cupcake and pipe in the mixture. If you don't want to take the time to pipe the filling in, simply spread the mixture on top of each cupcake evenly. Let it firm up for a few minutes in the fridge before frosting. Next, beat the heavy whipping cream and espresso powder until soft peaks form. Add the cocoa powder and powdered sugar (start with 1 tablespoon, add more to taste). Frost the cupcakes with the whipped cream mixture using a knife or another pastry bag fitted with a tip for a decorative look. Triple chocolate sounds pretty perfect to me! Ooooh these look SO good. Rich and completely chocolately. Chocolate isn’t my favorite dessert, but it most certainly is Joey’s favorite. He could eat a chocolate dessert every night of the week! Yep, triple chocolate would make even the worst day a little better! Delicious. Sorry about your plants, that really stinks. We have only planted potatoes so far, it snowed yesterday, so we are waiting a while. Oh my goodness. Those look so, so, so good. And I don’t have any chocolate in the house! DRAT! you better believe these are getting made this weekend. THANK YOU! Baking is a wonderful distraction! We have a thunderstorm going right now and I keep thinking, “I need to turn my oven on…” Hope your crop loss isn’t too severe — glad your greenhouse survived the hail — and thank you for the “distracting” cupcakes! I wouldn’t say no to those! That’s a bummer about your plants :( Mother nature is one tricky lady! This would make a perfect dinner, all by itself! Love it! Triple Chocolate + Nutella? These have to be the best cupcakes ever made. I can’t keep this to myself, tweeting them right now! sorry about your plants, i know how much effort, love and deciation to plant every year. triple chocolate..triple yes!! Oooooh, yum! Only four though, definitely going to be scaling up those quantities! These would be a big hit in my house…and the filling and frosting sounds delicious! You have such a wonderful site! I think these cupcakes could distract me from…anything!?! can i just leave out the esspresso powder since i don’t have any on hand? Nutella is truly sent straight from heaven. I am sorry to hear about your plants! I hope the re-planting is successful. Oh my word! These look like absolute heaven!! I love that the recipe only makes 4 cupcakes! Means I won’t gain 10 pounds if I make them :) So glad to have found your blog – I think my scale will thank you! Just made a big batch of these for a party at my husband’s work today. All I can say is WOW! The cake, super smooth filling (Nutella + sour cream = heavenly filling/sauce!) and fluffy, fragrant icing go so well together. The hint of coffee in the cake and icing is especially nice. I actually used Starbucks Via Italian Roast. This cupcake is one of the best things I’ve ever tasted in my life. Thanks for such a knock-out recipe. Will definitely make this one again soon!